Yet another bubble Bachmann sees is the “national security bubble,” and the repeal of Don’t Ask, Don’t Tell, the ban on gay and lesbian servicemembers repealed by the U.S. Senate in December, is one of those things that is creating the bubble. “President Obama is applying a politically correct standard to the United States military that cannot be tolerated in our country,” she said, adding that Obama is babying jihadists. Bubbles! 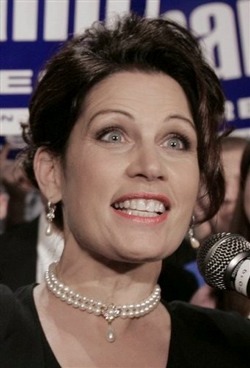 But if she really wants to support two-parent families, I’d suggest that she wrap her crazy eyes around the fact that there are lots of GAY two-parent families out there raising children, so unless Michele Bachmann wants to be seen as only supporting SOME children, she’d better sharpen up. Also, all sane military analysts agree that DADT repeal will strengthen our military. So that’s the part about gayness, but since this woman fancies herself a presidential candidate, it’s also important to note that in the same speech, Michele Bachmann suggested that Glenn Beck could fix our deficit with his chalkboards. Oh, goody.